Alejandro Gonzáles Iñárritu must think he’s the Howard Beale of cinema, shouting out the fallacy of Hollywood today. His previous films like Babel and 21 Grams were loudmouthed and shallow pictures over-swept with critical praise about how modern they were, addressing issues of the contemporary world. But much like Paul Haggis, Iñárritu possesses little understanding of reality outside his constraints and can’t help but shout out messages to his audience at the top of his lungs. While noticeably more humorous than Iñárritu’s other films, Birdman or (The Unexpected Virtue of Ignorance) is no different than Babel; even the title reeks of overt self-importance. Throughout the picture, Iñárritu makes a series of showy claims, accusing superhero movies of being pretentious, its stars who believe themselves as larger than life of being pretentious, celebrities who seek fame on Broadway as being pretentious, and critics who ignore the artistic merit of the work they criticize as being pretentious. In reality, Iñárritu seems to have little understanding about applying himself to his own standards, not realizing how pretentious his film is with its arrogant assertions. A director like Robert Altman or Jean-Luc Godard could have made Birdman into an effective, sharp satire, but Iñárritu doesn’t have the subtlety or nuance of those two filmmakers. Instead he throws his morals and messages directly at his audiences’ faces, not too differently from the superhero movies he’s criticizing. Birdman stars Michael Keaton as Riggan Thomson, a washed-up actor who two decades earlier played the superhero Birdman on the silver screen. Desiring a much-needed comeback, Thomson stages a theater adaptation of Raymond Carver’s “What We Talk About When We Talk About Love,” but struggles with his pompous egomaniac co-star (Edward Norton), a jittery first-time actress (Naomi Watts), his moody girlfriend (Andrea Riseborough), and his pot-smoking daughter Sam (Emma Stone). Iñárritu’s casting is certainly integral to his intentions. Keaton’s most iconic role was Batman in the two pictures Tim Burton directed, playing up on that persona, so his character isn’t too far off from himself. While Keaton and his fellow cast members place much effort into Birdman, they can’t fend off a poor, clunky script that requires them to bombastically declare their emotions. The best performance of the film comes from Watts but her character is largely lost in the sea that surrounds Riggan. Keaton does his best as the film’s protagonist but is bogged down by Iñárritu’s forceful direction, preventing the actor from fully portraying Riggan’s big personality. The most notable aspect about Birdman though is its structure. Utilizing digital editing and filming, Birdman runs as if it is one continuous shot, an effect similarly achieved in Alfred Hitchcock’s Rope. While I’ve stated my love for tracking shots before, they’re limited to a short time for a reason. Cutting is necessary to add breaks and pauses within a movie to allow the audience to breathe. Birdman’s one comprises unrelenting action that never stops pounding away at the audience. Rope adverted this effect by easing the pace but Iñárritu only quickens up his film overtime, preventing any chance for smooth transitioning between scenes. Emmanuel Lubezki’s cinematography at times is as magnificent as his work in The Tree of Life but through the picture’s constant motion we’re not left with any time to appreciate his photography. While it pries itself to be the Sunset Boulevard for a new generation, Birdman has about the depth of a Family Guy episode. 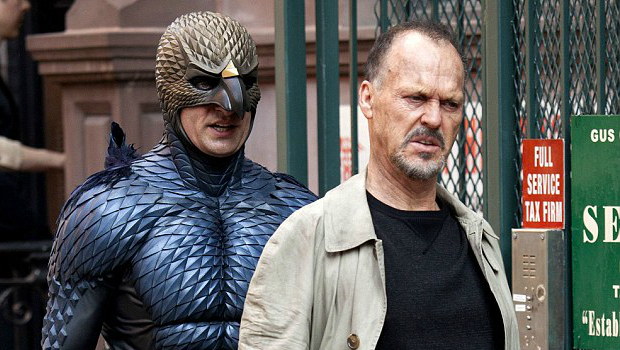 Mean-spirited, nasty, and shallow, Birdman is easily the worst Oscar winner to receive Best Picture since Crash. It’s a scandal this beat Boyhood to Best Picture at the Oscars but it’s obvious why: the film is an industry/actor friendly slight satire that Hollywood loves. I don’t see it standing the test of time frankly. I agree completely. I care very little about the Oscars actually, but this was far inferior to Whiplash and Boyhood. That’s a great read (and good to see you posting a review!). I bought into Birdman, and I’ve enjoyed all of Iñárritu’s films to date, but I like the arguments you put forward against the film. Personally I liked its rhythm and felt it probably was among the best of the year, but I agree with your comment above – Whiplash and Boyhood are both better films. I also thought Foxcatcher was better. Thanks, and I agree with you on Foxcatcher. That was a great film and it’s a shame it was ignored by the Academy. Ouch! Scathing review and very unlike anything I’ve read on the blogosphere so far. Good on you, man. I actually really liked the film but you put up a fine argument here. Altman would have been more subtle and probably more effective with this material. Great read! Thanks. Yeah, I know a lot of people really liked this movie but I found it too pompous. I’d like to see what Altman would have done with this material, that would have probably led to a better film. I so agree! It is well made but I think we will look back at it like American Beauty which won a bunch of awards but most see as pretentious mess now. I found it very predictable and I didnt like how all the women are the same- shrill, judgmental shrews. I get why Hollywood loves it but why so many Americans loved it I have no idea. It would have been my 7 out the 8 nominees. High five for a fellow American Beauty hater. I despised that picture as well, and Birdman’s just as shrill and bombastic. You should have talked to me….though I verge in the other extreme. I loathe this movie. I hate the way it delivers a point in a perfectly acted scene…and then proceeds to explain the point to the audience in detail. Urgh! I always though that stories which tell instead of show are awful, but I now know that stories which first show and then proceed to tell as if you are a braindamaged five-year old is even worse. This movie is like sitting in front of a perfect dinner and just when you intend to taste it, someone takes the fork out of your hand in order to chew it for your. Though, in defence of the movie, I don’t get why so many people think it lashes out against Superhero movies, it lashes out against the acting business in general, against all the self-importance you find behind stage. It is actually a very realistic portrayal…but that it is delivered in the most pretentious way possible makes the movie a very hypocritical piece. I agree. It’s as if Iñárritu has no faith that his viewers can grasp the film’s obvious metaphor. He always has the bash the message over the audience’s head. Im so glad you commented because Ive been so curious what you thought about it. You are so right about it making its point and then ramming it into the ground over and over again. And it does it in such an unpleasant way especially with the women. At least in a Woody Allen or Robert Altman movie about entertainment or people with big egos I usually like the characters or get some glee in their downfall. I watched it 3 times just to see if I was missing something and I still dont get the love. In fact I disliked it more on a third watch because the cinematography loses its appeal. I think it will be like American Beauty which everyone thought was all deep and meaningful but I always thought was distasteful and preachy. I liked Emma Stone. Sam ended up the only character whose name I could remember at the end of the movie, and the whole thing with “he told me I am special and then I realized I wasn’t” – that was actually kind of interesting. Plus, her character was the only truly likable one (might be the performance, though). The lesbian kiss enraged me. Not because I have something against lesbian on screen, but they had this great scene of two woman comforting each other (and in fact, it’s the only scene in the whole movie in which two females share a scene, we don’t even get to see mother and daughter in the same room), and it was good, and then they had to ruin it by letting it end in what looked like a male fantasy. Plus, the whole thing was never resolved. All the characters kind of just faded out of the movie, but it was particularly glaring in this case. I agree. Sam was the strongest character and totally feel the same way about the kiss. You are totally right. The ending was also so groan inducing. It was mostly predictable…the moment Norton complained about the gun I was waiting for Birdman to trying to shoot himself during the premiere – and failing to do so. If they had at least left it with that, instead they added on the ending I predicted before the scene (birdman flying away) for good measures on top of it. Yawn! Agreed. We are on same page on this one. Sorry such a long response! Great review. I liked it a bit more than you but I’m not huge on it. In fact I’m glad to hear from someone else who didn’t fall for it. I thought it had clever moments and some crafty camera work. But ultimately I don’t think it’s saying much of anything. I also don’t think it’s nearly as important or ground breaking as it thinks it is. Thanks. Yeah, it was apparent Iñárritu thinks he’s making a masterpiece. I just loathed how Birdman asserts it’s so important, there was zero subtlety in the picture. And it starts several intriguing side storylines but never does much with them. I also thought some things were just dopey like the stage critic nonsense. I did love the small theater setting and I thought Keaton was fun. The critic character was one of the movie’s worst aspects. She only served as a way for Iñárritu to complain about critics. Glad to see you posting a review, especially one that is so excellently written. Thanks man. What did you think of the movie? I haven’t actually seen it yet. I’ve heard some really good things about it, so it’s refreshing to read a different take on it. I liked Birdman but you’re right. It’s a nasty mean-spirited film. And it’s ironic how many critics gave this such glowing reviews when it portrays them with such contempt. P.S. I enjoy your actual movie reviews. You should write them more often. Yeah, I despised the way how Birdman portrayed movie critics. Everything in Birdman is so one-sided, it’s such an ugly picture. Unfortunately, I haven’t had too much time on my hands to write movie reviews over the past couple of months. I do hope to have posts out on Inherent Vice and Force Majeure in the next couple of weeks.